Previously the church of an Anglo-Saxon nunnery dedicated to St Frideswide, this building was promoted to cathedral status in 1546. It was most likely built in the 12th century, and was incorporated into Cardinal Wolsey's new college in the early 16th century. 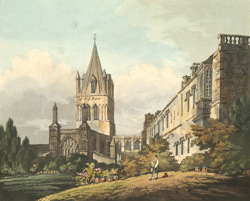 Around 50 feet of the nave was destroyed to make room for the college's quadrangle. Consequently, it is quite small for a cathedral church - only about 160 feet long.